We don't always want more "stuff", we just want the service it provides. So, could the company of the future move to a model in which they don't actually sell anything? Joe Iles, digital marketing coordinator of the Ellen MacArthur Foundation, examines the evidence. Businesses around the world are trying to find new ways to stay afloat and stay relevant in the light of a challenging economic backdrop and a new type of customer. What opportunities await those at the forefront of this shift? Doing business in the 21st century isn’t ever going to be straightforward. The rules of the game have changed, with a number of mega trends influencing the success and failure of today’s businesses. 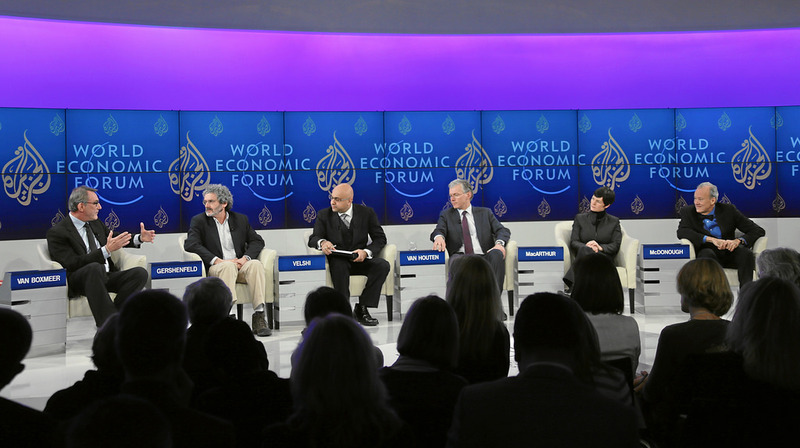 The search for economic development within the context of global constraints was the focus at this year’s World Economic Forum’s Annual Meeting in Davos last week. Resource constraints can dictate the earnings of many companies, with price increases in the first decade of this millennium effectively erasing the price declines enjoyed over the previous century. Many analysts think this trend won’t be reversed and higher prices are here to stay. With easily accessible reserves of resources and energy already heavily exploited, manufacturing today is subjected to unprecedented levels of price volatility in the commodities markets, something that’s tough to manage for most CFOs. Finally, 3bn new middle class consumers could enter the global market by 2030. They will all want access to the same goods and services as their predecessors, further compounding resource pressure. A circular alternative to take-make-dispose? In the face of this challenge, businesses, governments and thought leaders are searching for a way out – a new, resilient production and consumption model. Rather than trying to eke out resources and energy by using a bit less and recycling a bit more, a growing number are calling for a circular economy. This is an economic model which replaces today’s "take-make-dispose" economy with one that is restorative by design and in which stocks and flows of resources are rebuilt as opposed to degraded or disposed of. Crucially, research has suggested that this framework makes financial sense for businesses, customers and the wider economy. We estimate the potential scale of the business opportunity at more than US$1trillion, according to our research at the Ellen MacArthur Foundation, along with analysis by McKinsey. It is this potential that has seen the circular economy steadily rise up the agenda in Davos over the past three years; from a fringe topic in 2012 to a key subject of discussion this time around. At Friday’s press conference, Ellen was joined by Ian Cheshire of Kingfisher and Feike Sijbesma of DSM to announce the launch of Project MainStream, a two-year collaborative initiative between the Ellen MacArthur Foundation, the World Economic Forum and McKinsey, which aims to achieve circular flow of key materials, delivering benefits of US$500m in materials cost savings and 100,000 new jobs within five years. The level of discussion around the topic suggests a tipping point is near. In fact, many large companies all over the world have been putting this idea into practice to date by rethinking their core business models. Kingfisher has developed a ‘closed-loop’ calculator, enabling designers to assess the circular credentials of products on their shelves, as well as a modular paintbrush designed for reuse. Renault currently remanufactures a range of components in a plant on the outskirts of Paris, producing a turnover of €100m. Food company Bunge has joined the dots in its existing manufacturing processes to generate maximum value from the biological materials it already uses. So research and anecdotal evidence would suggest that there is a shift in progress, but what does this mean for the way in which we market goods? Let’s take the example of Philips. In a pioneering contract with architectural firm TurnToo, Philips showed how it is possible to move from selling light bulbs and light fittings, to simply lumens – light as a service. After all, it’s not the hardware the customer wants, but the light that it provides. The shift from ownership to access enables a closer, longer relationship between customer and manufacturer, during which improvements can be made to the price or service, with the manufacturer maintaining ownership of the product itself, for repair, reuse and recovery of materials. Philips and other first movers are on their way, with many more close behind, and this year’s unprecedented level of circular economy discussion in Davos suggests that businesses are taking note of a model that has the potential to provide prosperity in our uncertain economic future. After stepping off the boat at the finish line of her last round-the-world race, Ellen MacArthur saw parallels between life at sea and the global economy - you have access to a limited supply of resources, so their effective management is crucial to success. The Ellen MacArthur Foundation was set up in 2010, and works within business, education and insight with the aim of accelerating the transition to a regenerative circular economy. Have you defined your brand purpose?